The Iraqi forces (ISF) were fighting in the center and southern sections of the Old City. The Rapid Reaction Division was operating in Bob al-Tob one of the southern entrances to the district. The Golden Division and 16th Division were in Maidan, Kawazin, Qalahat, Barka, and Ras al-Koor, that was declared freed yesterday, in the middle of the Old City. Roughly 40% of the district remains to be freed. That area stretches from the Tigris River down to the southcentral neighborhood of Bob al-Tob. Some ISF maps show only the section along the Tigris as still being under Islamic State control, but those are inaccurate. Iraqi commanders and politicians continue to jump the gun on the finale in Mosul. Prime Minister Haider Abadi in his weekly speech congratulated the ISF for its victory in Mosul even though there is still fighting going on. Ninewa Operations Command head General Najm al-Jabouri predicted that the battle would be over in two days by July 6, while the Joint Operations Command had it at 3-4 days. 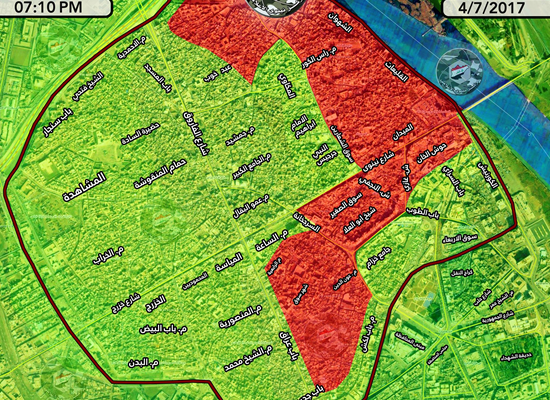 The ISF could also not agree on how much of the Old City they still had to clear. General Yahya Rasool told the press there were 300 meters to reach the Tigris, General Abdul Ghani al-Asadi of the Golden Division put it at 250 meters, topped by General Abdul Wahab al-Saadi, also of the Golden Division who had it at only 150 meters. All of these miss the point that simply reaching the Tigris will not mean that the fighting will be over. Al-Mada reported that the Iraqis wanted to declare the campaign over on July 4, the anniversary of IS leader Abu Bakr al-Baghdadi’s declaration of the caliphate, but that didn’t happen. These are all typical of Iraqi propaganda. Each division, and even commander is competing with the others to brag about how much they have done. The government’s demand for constant positive news in its victory narrative is another incentive for these statements. They should all be taken with a huge grain of salt as the ISF has proven to be consistently inconsistent and full of hyperbole. The Islamic State carried off another operation in a liberated section of Mosul. This time it ambushed 16 ISF members in Hadbaa in the northeastern tip of the city killing all of them. The militants crossed the Tigris, and snuck into the neighborhood. For the last week and a half IS has been launching these attacks almost every day. Most have been foiled, but they are spreading fears in sections of the city, and amongst the displaced slowing down the rate of return. As soon is Mosul is freed, the ISF will turn its attention to Tal Afar to the west. Ninewa Operations Commander General Najm al-Jabouri said that the 9th Division, Golden Division, and Federal Police will assault the town after they are finished in Mosul. Inside Tal Afar, the Islamic State reportedly executed some 200 Turkmen. The town has been surrounded for months, but Baghdad held off on assaulting it due to Turkish complaints about what would happen if the Hashd were involved, and attention being focused upon Mosul. Now that the latter is coming to an end, plans are finally starting to be formulated for the village. The Hashd were hoping to take Tal Afar, but are now busy along the Iraq-Syrian border. They were securing more towns in the frontier. Their base in the area is Baaj, which they have emptied of civilians and not allowed any to return. The mayor tried to go back and re-open his office, but was denied. They also repulsed another IS attack from Syria. The Hashd were excluded from entering Mosul by Prime Minister Abadi out of fear of the reaction of the locals to their presence. They were then told to take Tal Afar, but that was aborted. Instead they have been given the task of clearing the vast expanse of west Ninewa, which was largely absent of IS, but included a huge amount of territory. It appears that they are now focused upon controlling the border area and have set up a security zone there based around Baaj. They may also be preparing to create the much ballyhooed land corridor from Iran to Syria to assist Tehran in its backing of the Assad government. Both of those reasons are why they have displaced the locals. The United Nations’ High Commissioner for Refugees reported on the war widows in Mosul. It spoke with one woman who escaped the city, but were captured. Her husband was taken away and executed, while she and her children later escaped. Now they live in a camp and are worried about not only how they will make a living as the father was the money maker, but also what will happen to the children growing up without him. The U.N. estimated that more than 25% of the families at the Hamam al-Alil 2 camp south of Mosul were headed by women. This is another unintended consequence of the war versus the insurgency that will continue to influence Iraqi society. Former Ninewa Governor Atheel Nujafi continued to be a critic of the Mosul operation. He claimed that once the city is liberated there will be continued problems. He specifically mentioned a leadership vacuum. That may be true for the short term, but Ninewa does have a provincial council and governor, and local administration inside the city will be appointed eventually. Nujafi’s comments are also driven by his own desire to return to power in the governorate, so they cannot always be taken at face value. There are more signs that life is returning inside the city. The Higher Education Minister Abdul Razza al-Issa announced that Mosul University would officially re-open the next school year starting in September 2017. Work is already being done, mostly by volunteers to rebuild the facility, and a small group of students were able to take their exams in June. There is also an international effort to donate books for the university’s library. This is another instance of the resiliency of the people of Mosul. They have largely taken matters into their own hands to put the city back together. The school is a perfect example. Seven Christian groups met in Brussels calling for a Ninewa Plains autonomous region. The Plains were one of the traditional homelands of Iraq’s Christian community. They were nearly all displaced when IS took over in 2014. Many have gone to Irbil, Baghdad or other countries. There is an open question about how many will go back. Many mistrust their neighbors and fear for their security. While civil groups in the province have made efforts to welcome them back, and some priests are also calling for them to rebuild their communities, there are many others that are warning that there may be irreparable damage to their psyche and they may never return. The Islamic State tore apart Ninewa, and it will have a lasting impact. If the province losses most of its Christians it will be a huge blow to Ninewa and Iraq’s diversity that has already suffered so much since 2003.